I can't get enough of the Citi Bike data. Here is another look at the data via an interactive graph. You can change the x-axis on the scatter plot and see how it modifies the plot and correlation. This chart was made using R and the R packages Shiny, ShinyApps, and rCharts. You can find the code on Github. Alan Salzberg for for guidance with R and statistical methods. RStudio for Shiny and ShinyApps. Ramnath Vaidyanathan, online resources for rCharts and highcharts on Shiny. Citi Bike for providing system data. Weather Underground for historic weather data. What factors influence Citi Bike usage? Is temperature really having a statistically significant impact on Citi Bike use? What other factors influence Citi Bike use? If you wanted to take a deeper look at the data behind my last post, I've found a great tool for displaying the data online. ShinyApps.io allows you to take a set of R scripts and build an interactive webpage. You can see my code on Github. Which NBA franchise drafted best from 1990-2009? Conventional wisdom says certain NBA front offices (San Antonio, Seattle/OKC, Houston) are better at picking young players in the draft. Can we test this hypothesis with data? One approach is to look at WS (Win Shares). Basketball WS are a way to approximate a player’s value by aggregating points, assists, rebounds, efficiency, turnovers, etc in a single value. Here is a full breakdown. WS are not a perfect proxy for value, but they do allow for nice comparisons. Check out the list of all time career leaders in WS. The expected value in WS for each pick. For example, the first pick turns out to be worth 77 WS on average (explained below). How much each pick varied from the expected value (Shaq was selected first in 1992 and had 182 WS over his career, so he was a better than average first pick ). The cumulative difference between expected and actual value for all the picks each franchise made. Note that this approach doesn’t necessarily test for good outcomes. Charlotte drafted Kobe Bryant 13th in 1996 (173 WS so far) but didn’t get full value for him since they had agreed to trade him right away (for Vlade Divac who produced 54 WS for the rest of his career). This analysis will have a narrow focus: With the pick each franchise had, what was the difference in expected and actual WS (regardless of what they did later with that player). The data set (1990-2009) includes a lot of players who are still playing and thus producing WS. Lets use a multiplier to estimate the career length of every player drafted after 2000. Career length is highly dependent on how good a player is and injuries. We can't predict injuries, but we can estimate longevity based on minutes per game. Less than 12 minutes per game for a career = 2.01 seasons. More than 12 minutes per game for a career but less than 20 = 5.01 seasons. More than 20 minutes per game for a career but less than 25 = 7.59 seasons. More than 25 minutes per game for a career but less than 30 = 9.21 seasons. More than 30 minutes per game for a career = 10.88 seasons. Now, Kevin Durant, who was drafted 2nd in 2007, has a Modified WS of 133 instead of his current 73 WS. Once again, this is not a perfect method, but it will help us make comparisons. This analysis will underestimate WS for superstar players who will have long careers, but we can't see the future (if LeBron is a cyborg, however, a 30 year career seems like a safe bet). Lets figure out the expected value in WS for each pick. A simple average of 20 years of data produces this table. Note that the 13th and 21st pick are in the top 10 for expected value while the 6th, 8th, and 12th picks have underperformed in this time period. There have been lots of duds at 6 and 8, while Kobe at 13 and Rondo and Michael Finley at 21 boost their respective picks. Now that we have the expected value we can subtract it from the actual value for each pick. This creates a fun list of the best and worst picks. Finally, we can add up the delta WS for each franchise’s picks over the past 20 years. Cleveland is first?! Lets look at this more closely. Cleveland had a number of picks that dramatically outperformed their expected WS. Notably, many of those players have spent large chunks of their career with other teams. 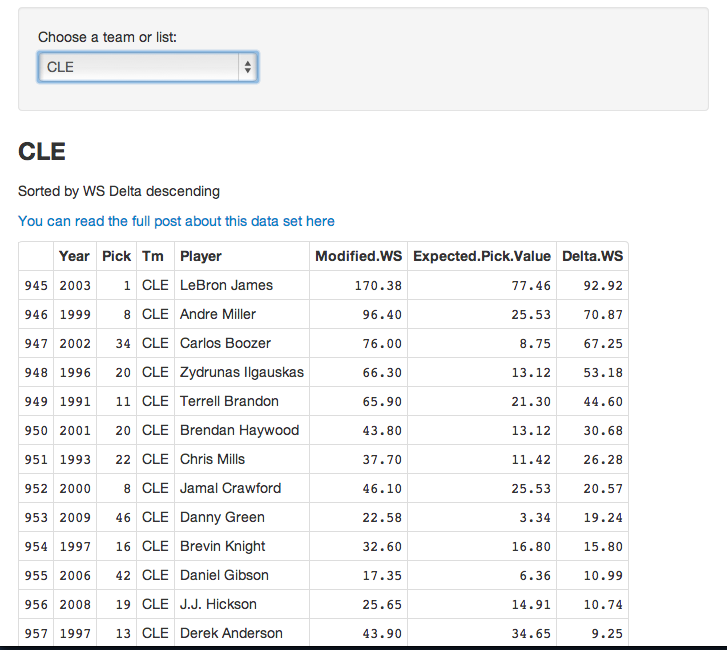 Cleveland's draft picks that produced negative value weren't as damaging as other teams. Success in the NBA isn't just about drafting well, but also developing talent, and making savvy signings and trades. I expected to see San Antonio and Seattle/OKC near the top of this list, but Cleveland and Phoenix are a surprise. Thanks to Basketball Reference for great data! You can take a look at my analysis here. Update 12/23/13: I've added this data to a Shiny R web app. 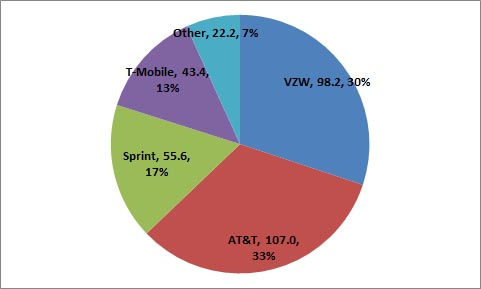 The US mobile phone service market is dominated by four players - Verizon, AT&T, Sprint, and T-Mobile. Verizon and AT&T command 63% of the market together and have roughly 80% of the most valuable spectrum. The big players also have a history of buying spectrum licenses not to build new services, but to prevent competition. This concentration of power has contributed to higher prices for US consumers and less competition than other countries. I find Verizon Wireless and AT&T's focus on restricting competition, instead of innovating in the consumer’s best interest, to be objectionable. As I have learned more about the telecom and wireless market, I have endeavored to support disruptive companies and technologies. I was an early customer at GrandCentral, which became Google Voice. I’ve experimented with various voice over IP technologies and no-contract plans. For the past year I have been a customer of Republic Wireless. Republic’s approach is to emphasis Wifi as the user’s primary connection and cellular as secondary (MVNO on the Sprint network). This allows them to offer some very low price points for no-contract plans. After a year with the Moto Defy XT, I’ve just upgraded to the the Moto X. The Defy is a basic Android 2.3 device that is somewhat limiting. The Moto X is a giant upgrade. The combination of a cutting edge phone and no-contract unlimited plans from $5 to $40 is awesome. I’m glad to give my money to a company that is innovating. Republic seems to be getting good press, and I hope they can continue to disrupt the mobile service space.